Wondering why it’s so hard to find a host for the Oscars? The Academy Awards honor yearly achievement in film. It used to be a quiet event, a dinner show with awesome door prizes, but now it’s a huge media circus, one that needs a ringmaster. But it’s more like a juggling act, and sometimes, the show drops the ball. Here are 10 really bad moments in Oscar host history. Desperate to appeal to younger viewers and raise ratings, the Academy thought it would try something new: Hire hot young actors with big name recognition but zero live comedy experience. It went about as well as you’d imagine. Reportedly, Franco and Hathaway were so inexperienced at performing live that it never occurred to them to watch footage of their performance during rehearsal to see how it was going. 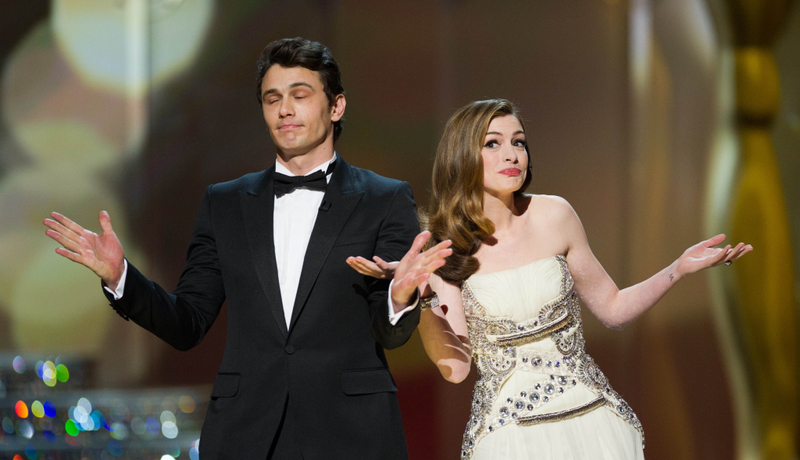 Franco was widely panned for seeming disinterested in the show as he was hosting it (his eyes are literally closed during their monologue), while Hathaway’s exuberance (at 26, she was the youngest Oscar host in history) was knocked for trying overly hard to make up for Franco’s lack of energy. It’s considered the worst Oscar show to date, and when you see the competition, you’ll see that’s quite an accomplishment. In the year when the wrong film was read out as the Best Picture winner (“La La Land” instead of the real winner “Moonlight”) — which, granted, is a pretty big mistake — only one thing could possibly be worse than such a mistake, and that’s a deliberate disaster. Host Jimmy Kimmel decided to go out in the middle of the live broadcast and grab an entire tour bus full of people and bring them into the auditorium, either showing the stars off to the tourists, or the tourists to the stars. The bus riders were confused, the audience and nominees were confused, and the television audience was split between jealousy and pity.